Cape Town Gutter Cleaners. Get A Competitive Quotation! In Need Of Gutter Services? Cleaning, Repairs Or Maintenance? We service all types of gutters including box, aluminium, copper, steel, plastic, vinyl, zinc, etc. Contact Us For The Best Professional Gutter Services In The Western Cape. Let’s admit it; no one likes the work of cleaning out their house or office gutters. Perhaps it’s because these are the areas around the home we just take for granted. As long as they’re working, we don’t pay them much mind. But the moment they stop working, become clogged, start smelling and rotting after some rain, we suddenly become very aware of the need for professional gutter cleaning. While you may want to call in the professionals, there are some basic gutter cleaning tasks you can take on yourself to keep your home in good standing. If nothing else, these tips will help you prolong the time between gutter cleanings from a professional business. What’re the Consequences of Clogged Gutters? Do you know what’ll happen to your property if its gutters aren’t cleaned? Clogged gutters will mess up your water drainage, and not even to talk about the havoc it wreaks in other ways. It can end up leaking into your home, damaging the roofing, ruining your home’s curb appeal and even seeping into the base of the structure. You’ll soon be sitting with rotting water damage on your hands. Another consequence of failing to keep your gutters clean is that it can fill up with grit, leaves and debris. In extreme cases, it can even create an ice dam on your roof in winter. This is the last thing you want, not to mention the resulting unwelcome guests of bugs and mosquitoes setting up a nest in your roof. If you decide some DIY maintenance is in order, gather the appropriate cleaning gear you’ll need to keep your gutters clean between professional cleanings. A trowel will be handy to scoop up leaves and other debris and have a bucket at hand to transfer it all into. Consider carefully whether you’d want to reach up to heights to clean the gutters, as heights can be dangerous. If you do decide to do it, make sure you have a sturdy and reliable ladder at hand that’s capable of handling your weight. Gutters are high you know… Whenever you’re cleaning out gutters, make sure you wear gloves, so you don’t touch dirt directly. Nicks and cuts can quickly become infected if you’re not careful, and that’s the last thing you want. Once you’re ready to start cleaning, it’s recommended that you begin at a drain outlet, and begin shovelling out rubble from that point. 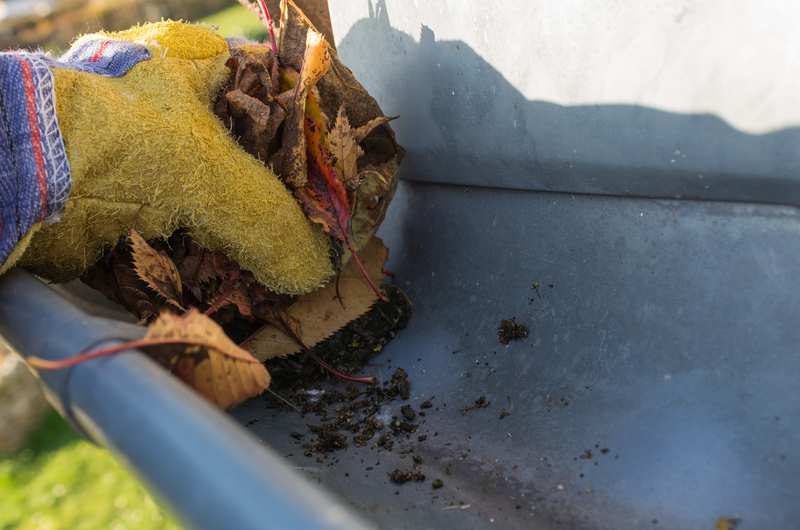 Moving away from the drain outlet, ladle up the leaves and debris and collect it into the bucket. Keep in mind that your drain pipes will also need to be kept clear of any blockage. If they aren’t clean, try blasting water through. Of course, if you don’t want to be bogged down by the hassle of keeping your gutters clean, you can rope in the professionals. These professionals have many years’ experience and expertise in delivering the exceptional service and the results you’re after. Keep your home’s gutters looking great with the help of seasoned experts available whenever you need them. Phone us for a FREE quote!